Center for Family Strengthening provides Mandated Reporter of Suspected Child Abuse Training for medical/health professionals, schools, child-service organizations and government agencies. To arrange a training contact call 805-543-6216. 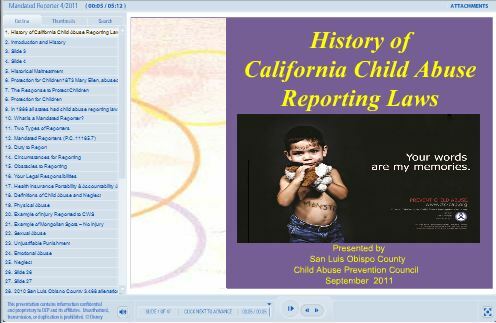 Training is provided for professionals who are mandated by law to report incidents of suspected child abuse.These professionals include educators, clergy, healthcare providers, recreation leaders, therapists, child protective service workers, group home employees, law enforcement personnel, and others working with children and teens. Training sessions are held throughout the County at various times during the year. If you wish to request a training sessions, please call 805-543-6216. If you are a reporting as Mandatory Reporter, complete and file a Suspected Child Abuse Report (SCAR) Form. Retain a “readable” copy of the SCAR Report. YOU are responsible for making this report. DO NOT ALLOW your supervisor/principal to make the report for you or assume because another co-worker has some of the same information that they will make the report. Do not attempt to investigate, interview or interfere with the information you hold. The following are guidelines as to when a mandated reporter is to report suspected child abuse.